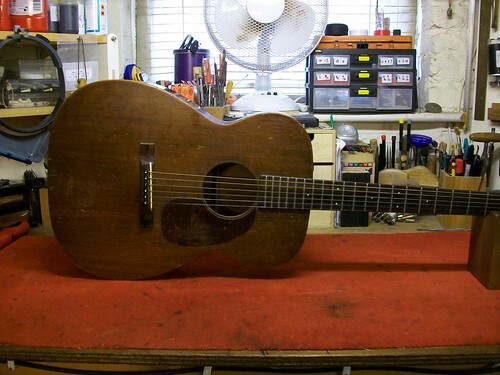 This little gem has some all too familiar problems; it has severe soundboard bellying, the neck is loose giving a high playing action. All of which has probably causing the bridge to lift. 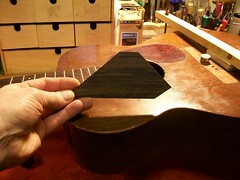 With all bridge-lifting or bellying issues the first thing to look at is the internal structure of the soundboard. 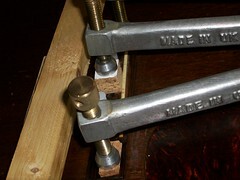 Using lights and mirrors to scrutinise the internal bracing it is discovered that the bridge plate is a little loose and not glued at its edges. 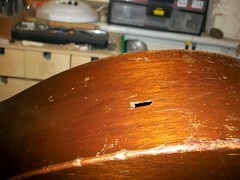 By removing the bridge and bridge-plate the soundboard can be returned to its original flat shape. 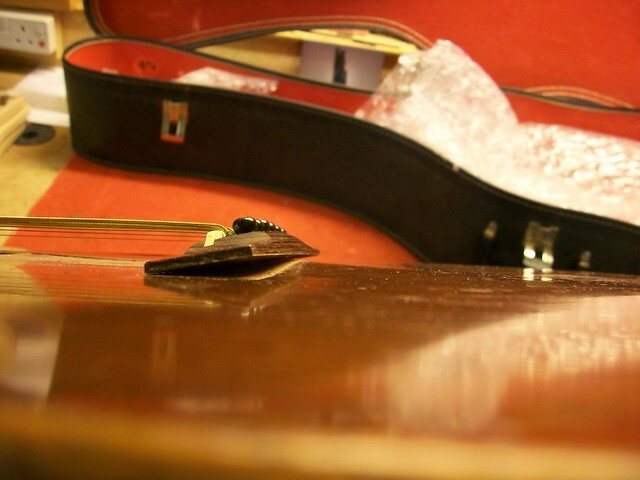 With very little effort the bridge is removed. 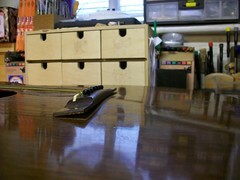 The bridge-plate is soaked overnight. 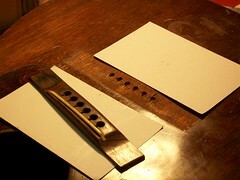 The next day, with a little heat, the bridge-plate becomes detached very easily. 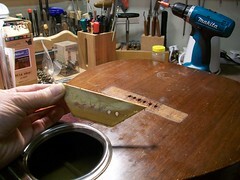 With this area of the soundboard in a “damp” state, the soundboard is clamped into a negative bow and left to dry out for a week or so. 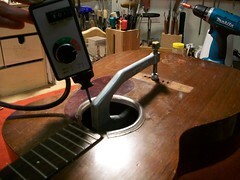 This will help the soundboard regain its correct shape. 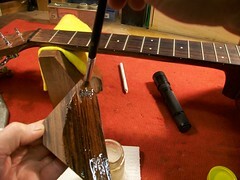 Once completely dry a new bridge-plate is made up from Indian Rosewood and glued into place. 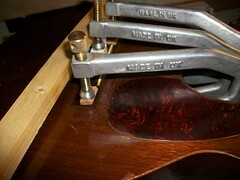 Hide glue is used because it is reversible, this will make the plate easier to remove in later years if necessary. 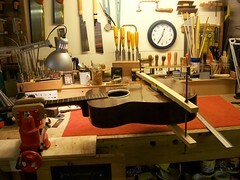 With the soundboard still in its negative bow the new bridge-plate is fitted, clamped up and left to dry overnight. 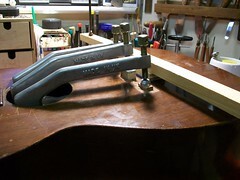 The bridge footprint on the soundboard and the underside of the bridge are cleaned up and with the soundboard still in its negative bow the bridge is glued into place. 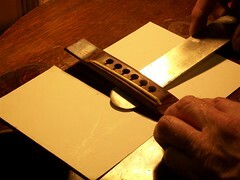 Hide glue can be diluted to such a viscosity so as to be used in a syringe. 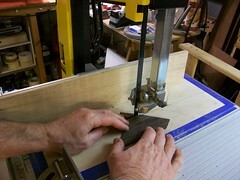 Using this method the issue of the loose neck is easily solved by injecting Hide glue into the join and clamping overnight. 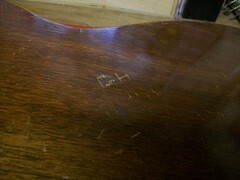 The hole and initials are patched up and cleaned up so as not to look too “over worked”. 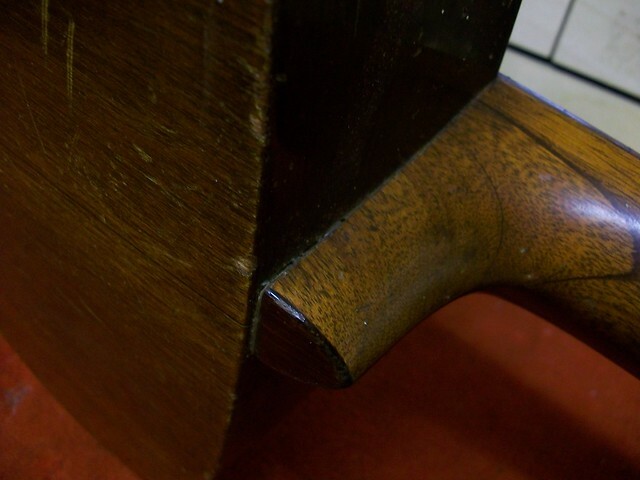 This is quite often a good way of resolving damage to a finish that is already distressed from years of use. 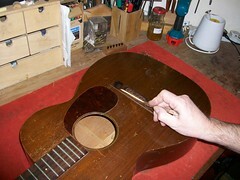 Suitable replacement machine heads are not available at the time of stringing up this old Martin. 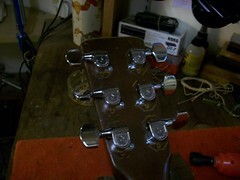 This will be done when appropriate tuners become available. 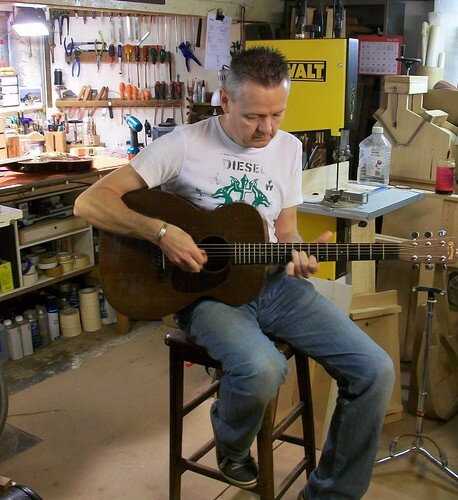 Glenn of Glenn’s Guitars plays the changes and checks over the finished results.